Late in the afternoon on 30 May, biochemist Virginijus Šikšnys received a phone call that is the stuff of a scientist’s dreams: The Norwegian Academy of Science and Letters informed him that he had won a prestigious award, the Kavli Prize, for his “seminal advances” in developing the revolutionary genome editor CRISPR-Cas9. For Šikšnys, who works at Vilnius University’s Institute of Biotechnology, the recognition was doubly sweet because his part in the discovery of CRISPR often has been overlooked. 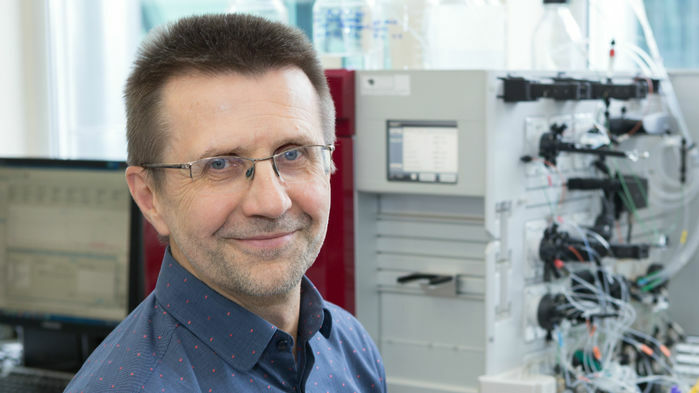 Šikšnys will share the $1 million award with two researchers who have received far more attention, Jennifer Doudna of the University of California (UC), Berkeley, and her collaborator, Emmanuelle Charpentier of the Max Planck Institute for Infection Biology in Berlin. Conspicuously absent from the award was another researcher who has enjoyed the CRISPR spotlight, chemist Feng Zhang of the Broad Institute in Cambridge, Massachusetts. Šikšnys first showed that the CRISPR-Cas9 system, a bacterial immune mechanism, could be transferred from one bacterium to another. He also independently made the same advance as Doudna and Charpentier: developing a way to steer the CRISPR-Cas9 complex to specific targets on a genome, which he called “directed DNA surgery.” Zhang’s group made its mark by building on these findings and publishing evidence that CRISRP-Cas9 could work in mammalian systems, including humans—which has been the centerpiece of a prolonged patent battle between the Broad group and what’s known as the UC team. Doudna and Charpentier reported their findings in a landmark Science paper published online on 28 June 2012. But it took Šikšnys 5 months to publish his study; it was rejected by Cell and Cell Reports , and then moved slowly through editing at the Proceedings of the National Academy of Sciences ( PNAS ), which published it online on 25 September 2012. Science Insider recently spoke with Šikšnys. He declined to comment on Zhang not being included in the Kavli award, nor did he want to address his prospects for sharing what many expect will be a three-person Nobel Prize for the CRISPR discovery. The interview has been edited for clarity and length. Q: What was your reaction to the news? A: It was a really surprising call from Oslo. Q: You’ve noted before that “you struggle with” the fact that your paper’s publication was delayed. A: We struggled, but finally the recognition came. It’s a really great feeling. Q: Why do you think Cell , Cell Reports , and PNAS took so long to see the light regarding your paper? A: This is a question that probably should be addressed to the editors. I haven’t asked them. Q: What do you tell your postdocs about the world of science and recognition? A: Do your job and in the end, you get some rewards. Q: Have you received enough recognition now? A: It’s always a discussion like peanuts, whether you get enough. Q: What do you think of the relative contribution Zhang made by taking CRISPR-Cas9 into human systems? A: It probably was a logical step to move into human cells or eukaryotic cells. This led to really a huge number of applications. Q: Have you weighed in on the patent debate? A: I’m following this, as many people do. It’s probably the field of lawyers and not scientists. Q: Do you support one or the other? A: No. It’s a different thing to support football or baseball teams.